Following the success of the inaugural Pho Day 2017 in Ho Chi Minh City, Tuoi Tre and Japanese instant noodle producer Acecook are taking the event on the road to the AEON Mall supermarket in the Vietnamese capital city’s Long Bien District on December 12. This year’s event, themed “Honoring Vietnamese Flavor – Journey to the Old Pho,” will feature a gallery presenting a brief look at the dish’s 100-year history, its spread throughout Vietnam and the world, and its modern variations, according to Do Van Dung, deputy editor-in-chief of Tuoi Tre. Visitors to the celebration will be treated to free pho tastings from 11:30 am to 12:30 pm and 5:30 pm to 6:30 pm on December 12. In addition, an awards ceremony to recognize contributions toward the development of ‘Day of Pho’ and the outstanding entries in the ‘Ky uc ve Pho’ (Memories of Pho) writing competition organized by Tuoi Tre will also be held in conjunction with the event. Over 3,000 visitors are expected at the festival and 200 people have been invited to the gala. The organizers hope that the second Pho Day will help to boost the dish to the same level of fame as other national dishes, such as Italian pizza, Japanese sushi, and German sausage. Kajiwara Junichi, general director of Acecook Vietnam, said that “spreading the love for pho so that more and more people will understand it” was a primary factor in his company’s decision to co-sponsor the event with Tuoi Tre. It has become a habit for Junichi to break the ice with Vietnamese business partners and friends by sharing his passion for pho. 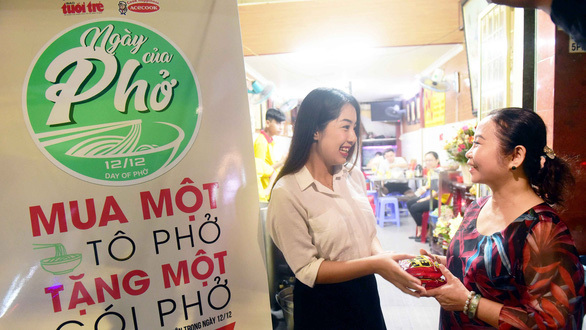 “I love Vietnamese pho,” the Acecook executive told Tuoi Tre as he began recalling the company’s decades-long relationship with Vietnamese rice and its products. When Junichi first came to Vietnam in 1993 to launch Acecook, the company set its sights on developing a wheat noodle version of pho. On this day, restaurants, pho eateries, supermarkets and convenience stores in Japan offer discounts, gifts, and promotions to help consumers learn more about the Vietnamese dish.